Posted by Mrs Weird Scientist in Environment, Microbes, Think About It. Imagine a world where you are all alone and surrounded by complete and total darkness. Now, take away all of your oxygen. Sound scary? Not necessarily. For the Desulforudis audaxviator – or bold traveler – this is the normal way of life. This bug relies on some important things for its survival: water, hydrogen and sulphate. It was recently discovered by a group of scientists led by Dr Dylan Chivian of California’s Lawrence Berkeley National Laboratory. The results of the research were published in the journal Science. Credit: Greg Wanger, J. Craig Venter Institute, and Gordon Southam, University of Western Ontario. This lonely baterium travels in complete darkness. So, why should we care about this lonely bug that braves its world alone? Well, if we think about how this rod-shaped bacterium can survive without oxygen, we might be able to get some important clues about whether life exists on other planets. If we found life on other planets, we would maybe learn that those bugs and creatures are able to get by without oxygen while still obtaining energy from chemicals such as sulphate. Let me tell you, scientists were really excited when they discovered the bacterium. But, it wasn’t easy! They found it 1.74 miles (2.8 km) below the Earth’s surface near Mponeng mine, which is close to Johannesburg, South Africa. The bug was in total darkness and 60 C (140 F) heat. Now that’s hot! Scientists originally found the bacterium in DNA that was drawn from cracks in the mine – filled with water. Who would have thought that it would be a gold mine where scientists would discover the first ecosystem that only has one biological species? Sometimes, it seems that darkness can be full of special surprises and this is especially true in the case of our bold, lonely traveler. Since our isolated bacterium lives all alone, it has to get organic molecules without any help from other species. To do this, it builds what it needs to survive from water, inorganic carbon and nitrogen. These are all sourced from ammonia in the nearby rocks and fluid. But it sure does live deep in the Earth, doesn’t it? Thanks to evolution, our traveling friend can handle all sorts of tough situations and conditions. Over time, it has developed ways to handle stuff like fixing nitrogen straight from elemental nitrogen in the environment. But wait, it can’t do everything. 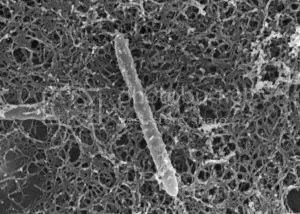 This smart bacterium can’t handle oxygen, which tells scientists that it has been without oxygen for a really long time. I guess that the lengthy journey into the Earth has toughened it up to lots of harsh conditions. However, without oxygen exposure, there was no need for it to develop any mechanism to resist it. Still, it continues to survive and hints to us that there could be a lot more bugs and creatures out there that manage to get by just fine without oxygen and many of the basic things we associate with life. Now that’s adaptation!